The provision of healthcare is moving increasingly away from the hospital and other traditional locations and into homes, which could free up swathes of the 305.7m sq ft estate belonging to the NHS, according to the chairman of NHS England. 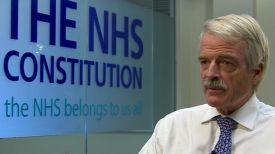 Sir Malcolm Grant CBE, said the statistics should be pause for thought in how healthcare needs to be transformed and in the role of the NHS estate. For every hour of NHS contact, patients engage in almost 5,000 hours of self-care. Grant was speaking to 200 industry professionals from London’s Royal Institution as part of an event organised by the Cambridge University Land Society. He described the provision of healthcare as a “cottage industry” and not adapting quickly enough to the changing patterns of health. “Freeing up the provision of care from the estate in which it has historically been provided could be a major lever for change,” Grant said. A radical shake-up of the NHS would aspire to models of integrated healthcare such as that of US supermarket giant Walmart, where GP clinics co-locate with shopping centres. NHS-owned assets that are vacant or underused are bigger in total than the size of London’s Hyde Park and could return £2.3bn in revenue to the healthcare provider every year. This was the first of several talks staged as part of the Cambridge University Land Society’s Whitehall Lecture Series, and officially supported by Estates Gazette. The next talk, on 12 June, will feature Kate Barker CBE on the UK housing policy.